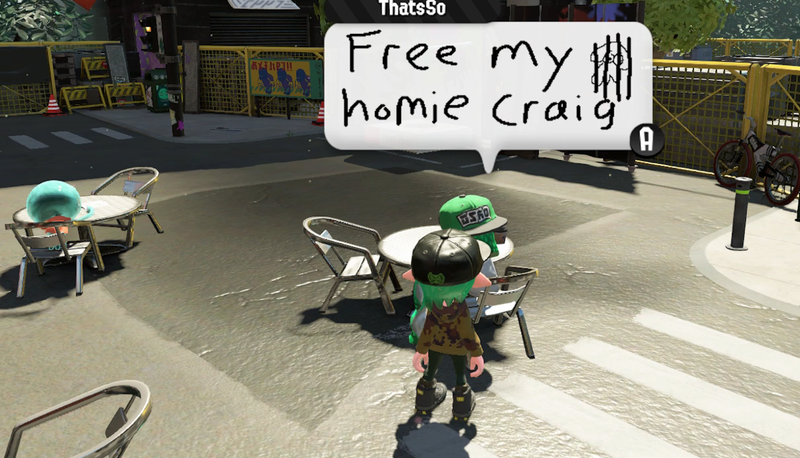 Spend a moment wandering Inkopolis Square today and it’s likely you’ll find posts about Craig. Craig is a Splatoon 2 player who claims that he was banned from the game for two weeks because he changed his name to Bike Cuck. Cuck, short for cuckold, is a term internet shitlords often use as an insult. It originally referred to a husband with an unfaithful wife but internet trolls toss it around with reckless abandon. The term is sometimes associated with the alt-right’s online presence. The name Bike Cuck in this case is a reference to a comic about someone’s bike getting stolen. Craig claims that Nintendo issued a 14 day ban for using the term, a change from his previous (and equally absurd) name “finna nut.” A tweet supposedly containing an email from Nintendo states that he was banned for “unsportsmanlike during online play” and an inappropriate nickname. In response to his supposed banning, players are filling the in-game lobby and social media with the hashtag #freecraig. Players reacting to the situation have fallen into three camps. Some are voicing their support and demanding that the ban be overturned, some support the ban, while those out of the loop are asking who the hell Craig even is after seeing so many posts about him. Others point to the charge of unsportsmanlike conduct as further justification for the banning. Craig claims that he will avoid inappropriate usernames in the future, at least for Nintendo games and finds the community artwork “a lot of fun.” Really though, I don’t know what he expected to happen with a name like Bike Cuck.